Episode 01 - Desperation - In this brand new adventure, Darren and his crew travel to Meteora, Greece, where they meet a woman who is desperate for peace in her life. Along the way, we wrestle with the question: what role does desperation play in God moving in our lives? Episode 02 - Weird Stuff - Darren looks back at some of the stranger things he's filmed, including miraculous gold teeth, and asks the question: if it's not in the Bible, can it still be God? Episode 03 - One Time Encounters - The full story behind the powerful encounter from Holy Ghost Reborn, where the team ministers at midnight in Thessaloniki, Greece. This leads to the main question: what is the point of a one-time God encounter if there is no follow up? Episode 04 - Importance of Experience - In this brand new adventure, Darren travels to Santarem, Brazil, to film a youth-led crusade by evangelist, Randy Clark. The goal: find a handful of kids who have never prayed for anyone before and watch them become the ministry team for the crusade. This raises the question: does experience mean anything in God's kingdom? Episode 05 - Justice vs Grace - The full story of the Latin Kings leaders who were highlighted in Father of Lights. You'll also gain a greater understanding of the gang mindset as Darren hears from another former Latin King in the roundtable, where they ask the question: where do you draw the line between justice and grace? Episode 06 - God & Trauma - In this episode, hear a powerful story of God healing past abuse in the wife of a pastor for 14 years, as well as the full story of the Navy SEALS in Holy Ghost Reborn. The question then is: can God completely heal past trauma in one encounter? Episode 07 - What is Love? - See the full story of Mike and Deena Vant Hul from Father of Lights, who sold everything and moved to China to care for the "least of these". Along the way, we wrestle with the question: what does love really look like? Episode 08 - The Catholic Divide - In this brand new adventure, Darren takes Todd White to the Vatican in Rome. Along the way they are able to sit down with a Cardinal, and even pen a letter to the Pope. The question here is: why is there such a divide between Catholics and Protestants? Episode 09 - A Creative God - Watch as God uses two separate behind-the-scenes experiences with animals while filming Holy Ghost Reborn to show His love, and then, as only God can do, He makes them related in the wildest way possible. All this leads to the question: why would God use creative ways to speak to us when He's already given us the Bible? Episode 10 - Street Preachers - Spanning multiple films, watch as Darren encounters a variety of street preachers with different mindsets but who are all a part of the same family. With various possible approaches, the question then becomes: what is the best way to preach the gospel? Episode 11 - A Choice Must Be Made - When God calls our name, a choice must be made. In this episode, two stories from Furious Love show both sides of choice. The leads to the obvious question: what role does choice play in our salvation? Episode 12 - Religion vs Relationship - In this brand new adventure, Darren takes his crew to various ancient religious sites in Athens and Delphi in Greece, where the gods of old are crumbling ruins, to show a God who is still very much alive. The question here is: what is the difference between religion and having a relationship with God? Episode 13 - God & Korn Part 1 - Part 1 highlights the full story of Todd White at a concert of the rock band, Korn, along with guitarist Brian "Head" Welch and bassist Fieldy. The question asked is: are Christians more afraid of darkness than God is? Episode 14 - God & Korn Part 2 - Part 2 finishes the full story of Todd White at a concert of the rock band, Korn, along with guitarist Brian "Head" Welch and bassist Fieldy. The question asked is: how can you be a Christian and still work in a dark industry? Episode 15 - The Journey - Watch the full story of Darren filming in Brazil with Nic and Rachel Billman for Holy Ghost Reborn, where they have "street church" with drug addicts and banquets for prostitutes. The question asked is: how much freedom should we allow in a person's journey? Episode 16 - Do What Jesus Did - In this brand new adventure, Darren takes three Kickstarter backers to Cape Town, South Africa, to "be the talent" who will pray for people. People who have never done this before see God move through them at a vineyard and atop Table Mountain. Which leads to the inevitable question: can literally anyone do what Jesus did? Episode 17 - Tongues - Darren explores the controversial subject of speaking in tongues, and even films himself being prayed to exercise this gift of the spirit for the first time in his life. The question is: why are tongues so controversial? Episode 18 - Does God Need Us? - God is moving mightily in the Middle East, particularly through dreams and visions. In this episode, we hear from Ali, who encountered Jesus while hanging out in Mecca, and also hear from other experts on the unprecedented rise in Muslims being born again by simply encountering Jesus in their dreams. Of course, this naturally leads to the question: does God really need us? Episode 19 - Hearing God - Watch the full story of Darren and Todd White in Monaco from Holy Ghost, where the guys have one day to try to discover why God sent them here, and why God told Darren to try to get on a boat. This leads to the question: how do you know if it's God or if it's you? Episode 20 - Why is Faith So Hard? - In the season finale, see and hear the full story of how Darren and Todd White got into the Dome of the Rock in Israel. Shooting on location, Darren and his friends give a full understanding of just how impossible this miracle caught on film was. In the midst of this massive miracle, we ask the question: if Faith is so important to God, then why is it so difficult? 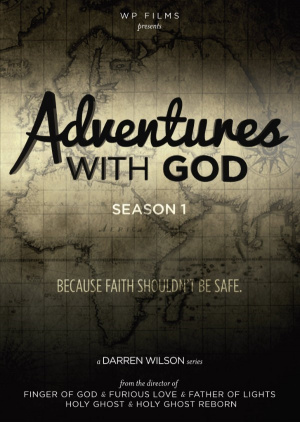 Adventures With God Season 1 by Darren Wilson was published by Authentic in May 2018 and is our 33657th best seller. The ISBN for Adventures With God Season 1 is 5060424955886. Be the first to review Adventures With God Season 1! Got a question? No problem! Just click here to ask us about Adventures With God Season 1.